Ever daydream about visiting the small town of Hawkins, Indiana to hang out with Mike, Eleven and all their friends? Well, you might want to rethink that idea. Halloween Horror Nights has introduced a new maze this year that allows you to do just that, and it's absolutely terrifying at every turn. This isn't a pleasant or charming trip into the Upside Down. It's a twisty, gut-churning labyrinth of horrors that will have you jogging towards the exit faster than Benny can flip a burger. The new Stranger Things maze excels at pulling you directly into the show. And as any fan knows, while there are a few laughs to be had, it's a pretty terrifying scenario. The maze revisits some of the key sets, and puts you directly into the action. The Netflix series evokes pure nostalgia for a bygone era in horror and fantasy adventure. You'll feel like you've stepped directly into the 80s for a short stretch, as you proceed to scream your green guts out. Some accuse Stranger Things of being a rip-off hinged mostly on the tropes found in old Stephen King and Steven Spielberg movies. But it managed to bring something new, while pushing all the right nostalgia buttons. Stranger Things curbs quite a few scenes from the 1982 classic E.T. The Extra-Terrestrial. So it's quite fitting that as you enter the fake forest, longtime park goer will recognize that they've refurbished pieces of the old E.T. ride turning something old into something new and very scary. While Universal isn't afraid to recycle some of last year's frights into this year's new mazes, this is particularly prophetic and just down right perfect. And if you remember that old E.T. ride, you will be stabbed in the chest with perfect pains of nostalgia right off the bat, just like you are on the show. The Stranger Things maze only covers Season 1. So don't expect to see any of the characters or new creatures from Season 2 crawling around inside. Perhaps next year, you'll get to experience little demodogs running around, or be shocked into a heart stalling stance of pure terror at the sight of a giant Mind Flayer come to life. This year, we're greeted by the Demogorgon, and he does a fine job of scaring the skin off your bones all by himself. There are a couple of Demogorgons hiding throughout the maze, waiting to pop out where you'll least expect. 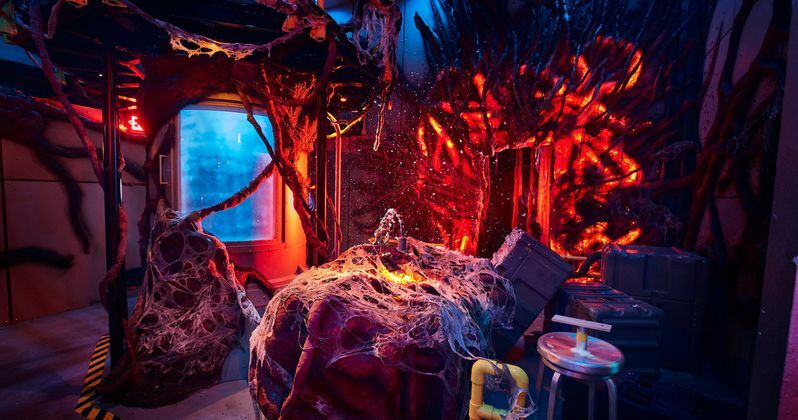 Fans get to visit Joyce Byer's living room, and there is a live actor playing the part, on the phone, too scared to notice us trampling through her house as a giant monster comes tearing through the wall. On our journey through the maze, we also get to visit Hawkins' laboratory, as the Upside Down comes to life around us. Inside the maze, the kids are all played by statues. But in the classroom, as Eleven has her climatic confrontation with the Demogorgon, the scene is so life-like you'll believe your watching a live performer. This maze literally puts you up close and personal with that fight, and it goes beyond any kind of 3D presentation you're bound to get. I've been buying up every little bit of Stranger Things paraphernalia I can get my hands on, and the Stranger Things maze at Halloween Horror Nights is the closest I've come to actually being able to be part of the show. Its a dark, dank way to spend the fall season. And it's worth every bit of that admissions ticket and the very long wait to get inside. For fans of both Halloween Horror Nights and Stranger Things who have a ton of money and like to travel, all three parks in Hollywood, Orlando, and Singapore have a different Upside Down experience. Each maze is still based on Season 1, but the teams behind each individual maze have made their own terror trap, offering up a unique experience at each location. Though each place is working off the same storyline, the individual parks have provided their own interpretation of events. In all three mazes, one thing remains in tact. Fans of the show will get to experience the terrifying take through the perspective of Will, Dustin, Lucas and Mike. Which means the Demogorgon is in full view very early on in the maze, as opposed to when you see him enter in the show, which doesn't really happen until episode 7. After you get finished screaming your face off inside this perfect interpretation of the Netflix series, Universal has also introduced an amazing Stranger Things menu that will help calm your nerves. While the new Poltergeist maze is pretty great, and gives Stranger Things a serious run for it's money, the trek into Hawkins is one of the best times you'll have this year, especially if you are a huge fanatic of the show, which I consider myself to be. My hope is that they bring it back next year with new Season 2 scares. Perhaps they can make it an annual tradition. You can buy your Halloween Horror Nights tickets right now at Universal Studios.